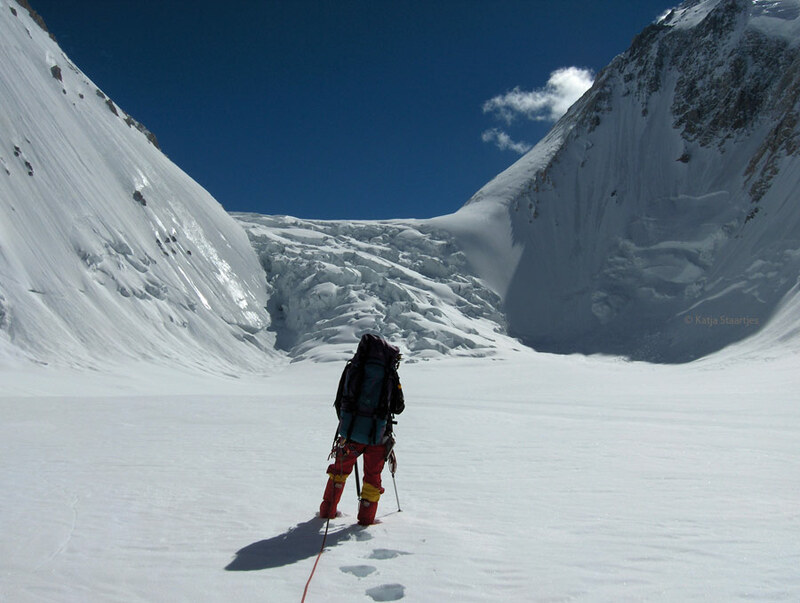 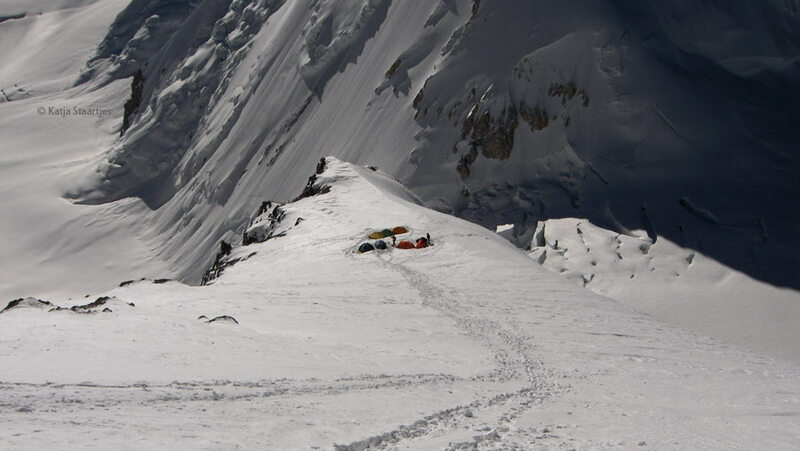 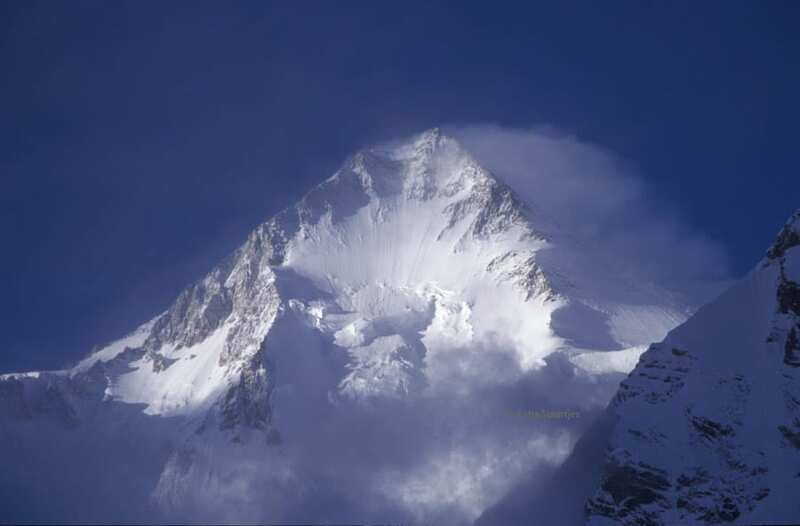 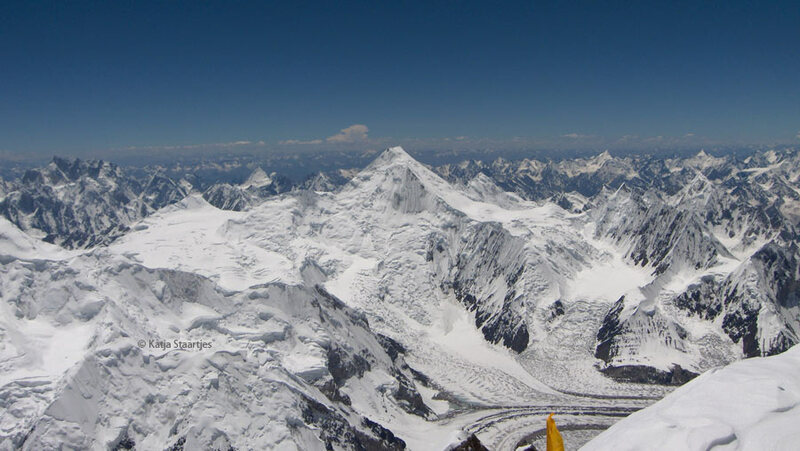 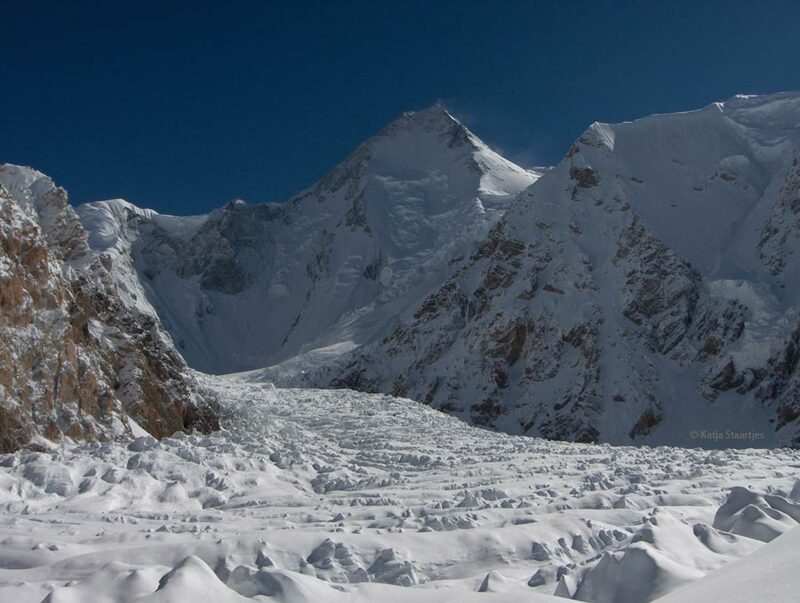 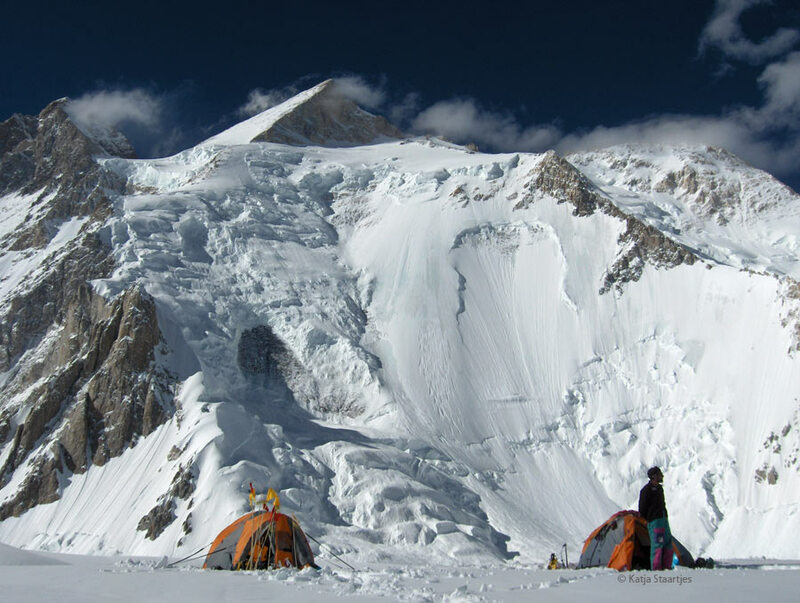 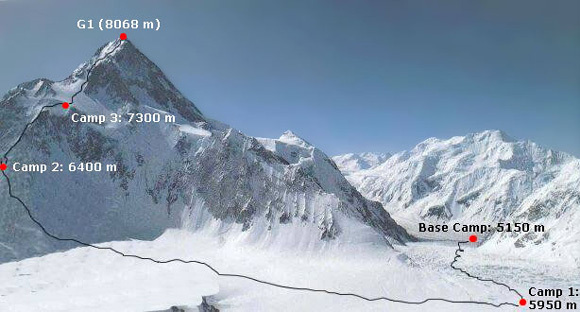 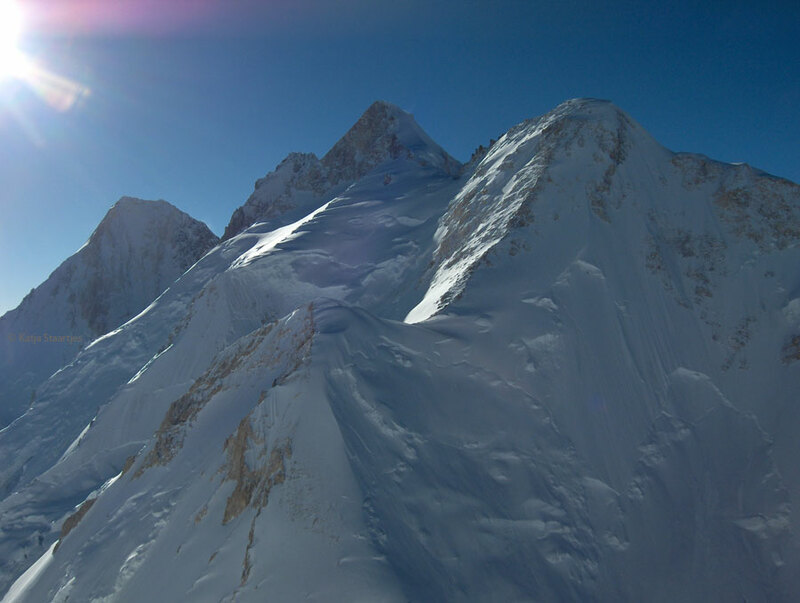 Gasherbrum 1 (G1) is also known as Hidden Peak, because it is only at the very last moment that you can see the peak. 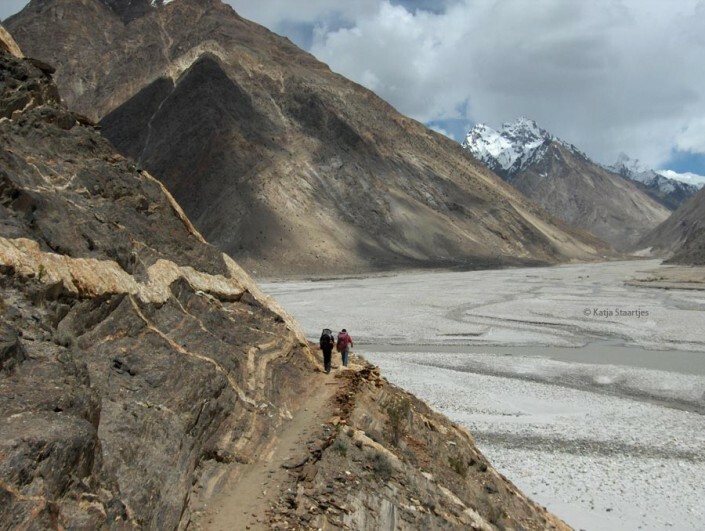 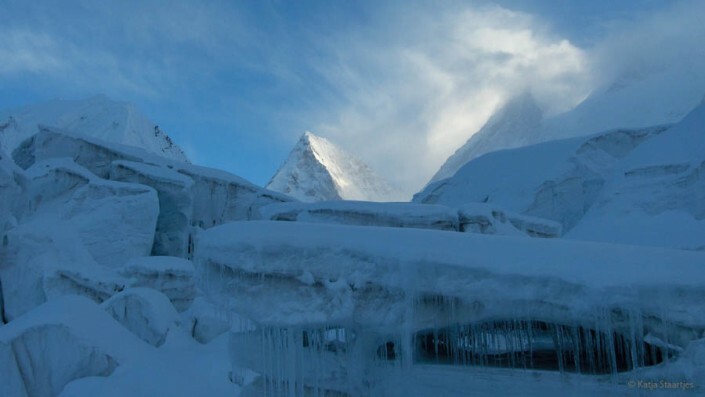 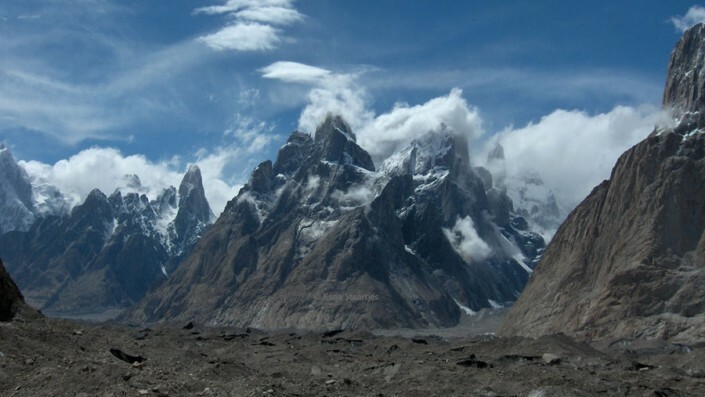 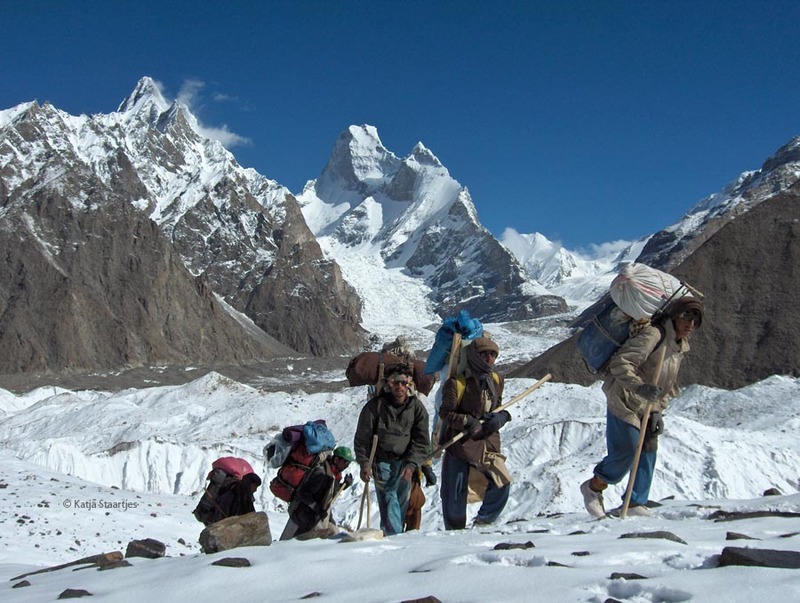 It is located in Pakistan in the Karakoram mountain range close to K2, and can be reached in a three day drive from Islamabad, with an 8-day trek over the famous Baltoro Glacier. 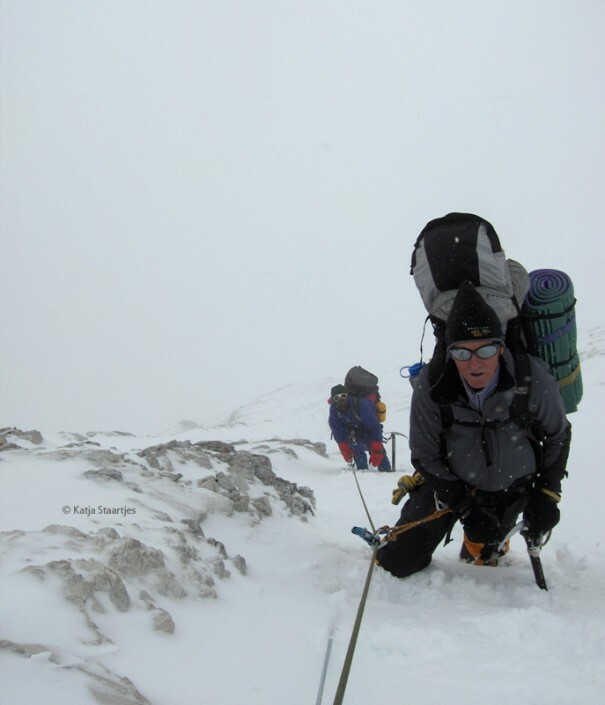 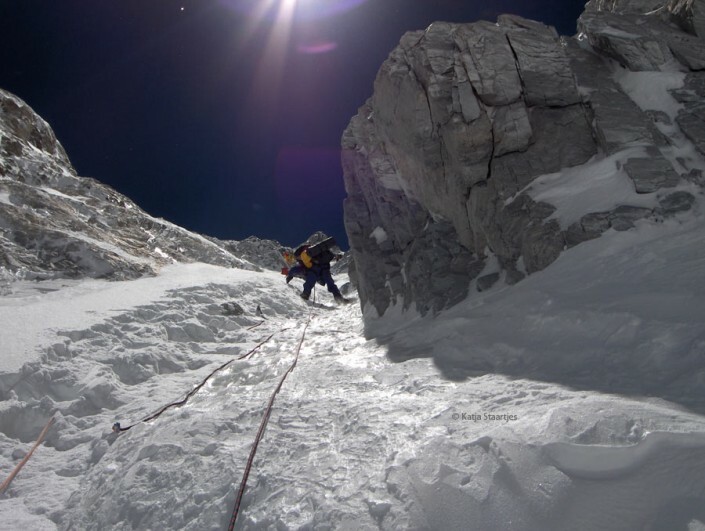 The mountain is very challenging to climb and has a small, pointed peak. 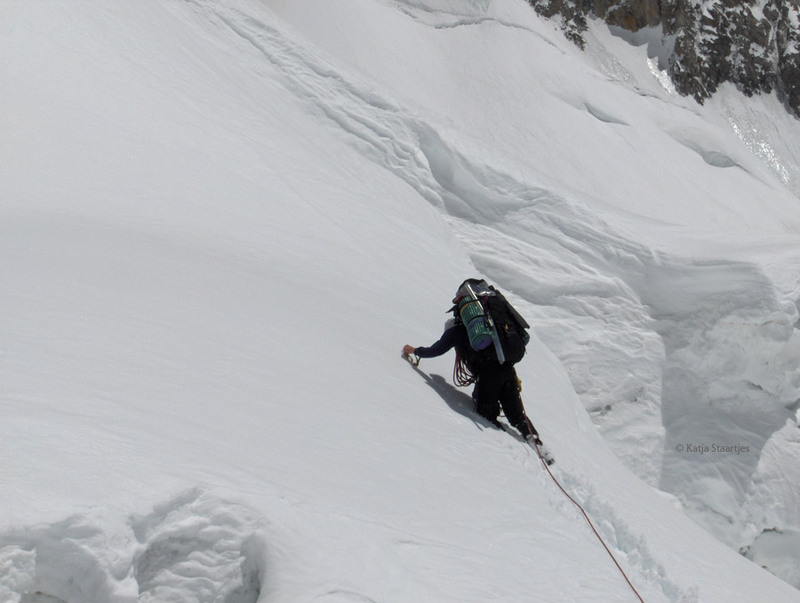 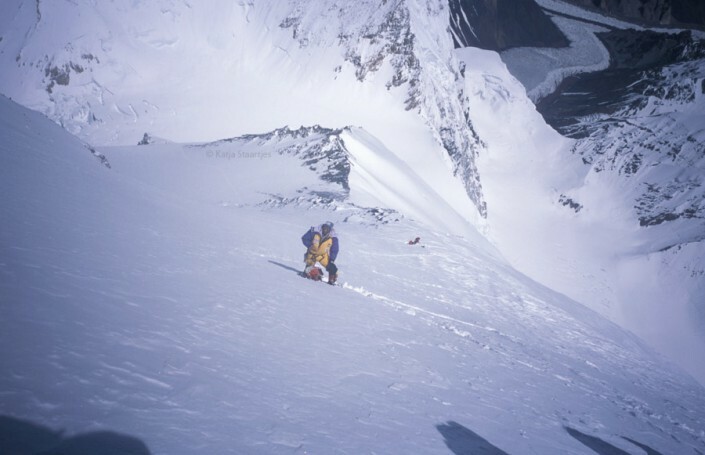 Its biggest technical challenges are at around 7,000 metres (a 70-degree couloi, the ‘Japanese couloir’) and a steep traverse (60 degrees) just below the peak. 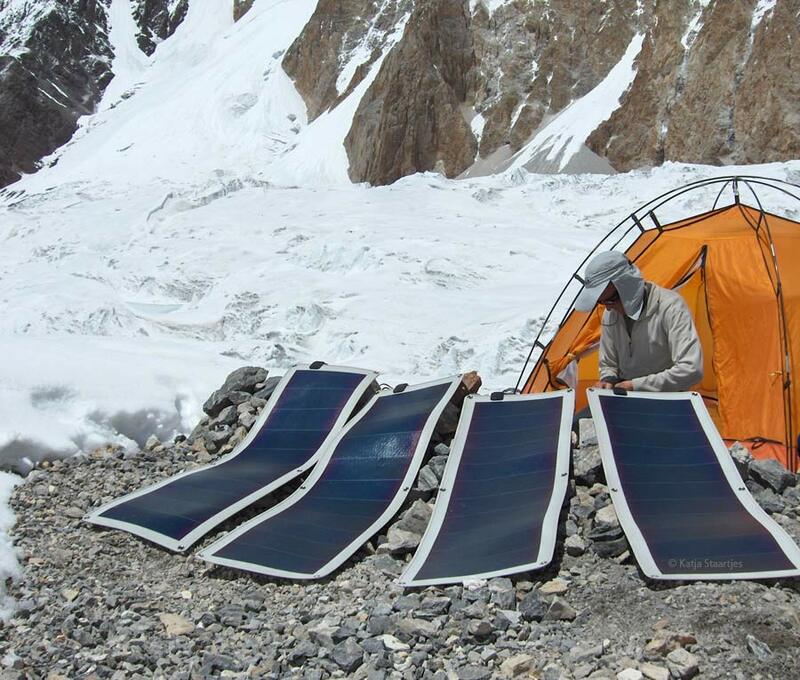 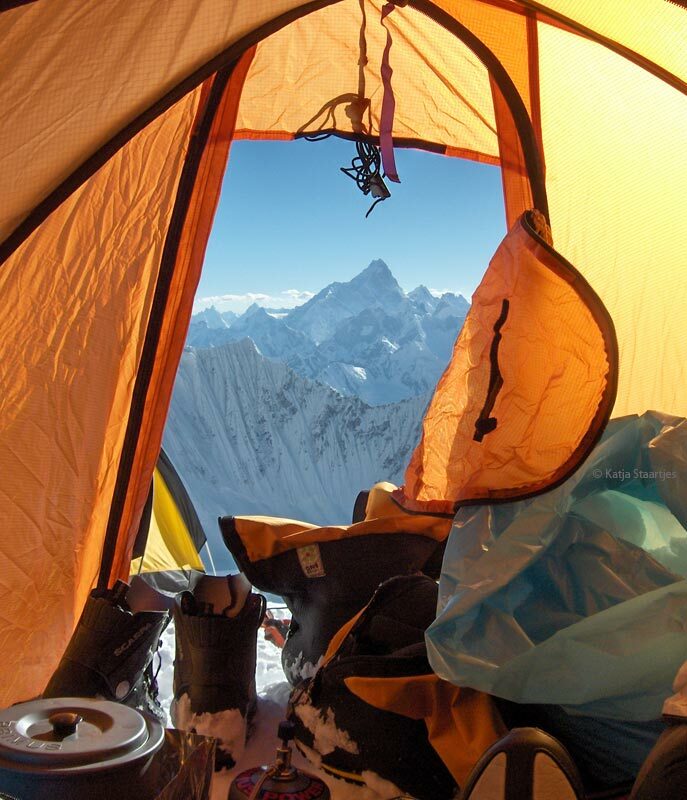 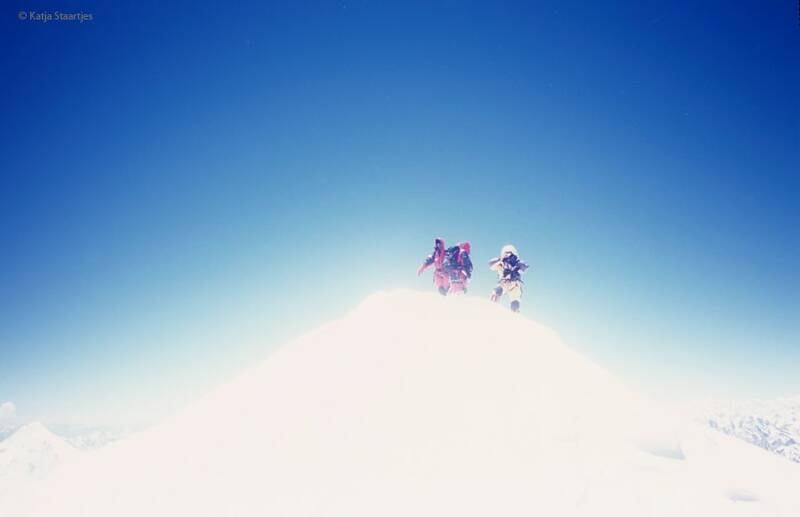 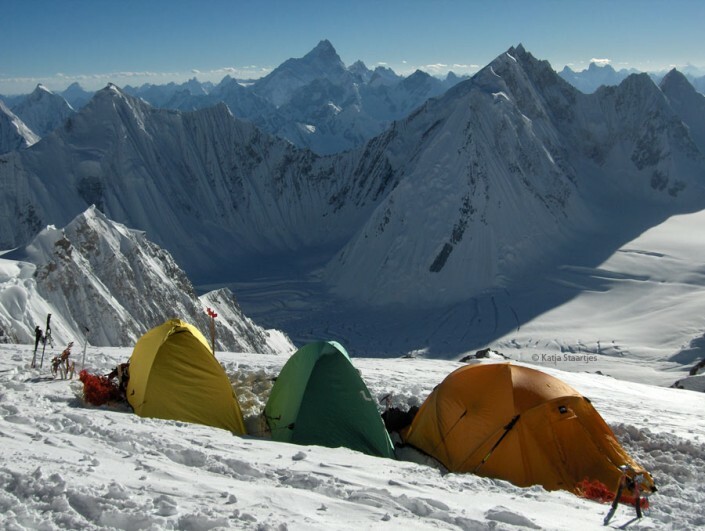 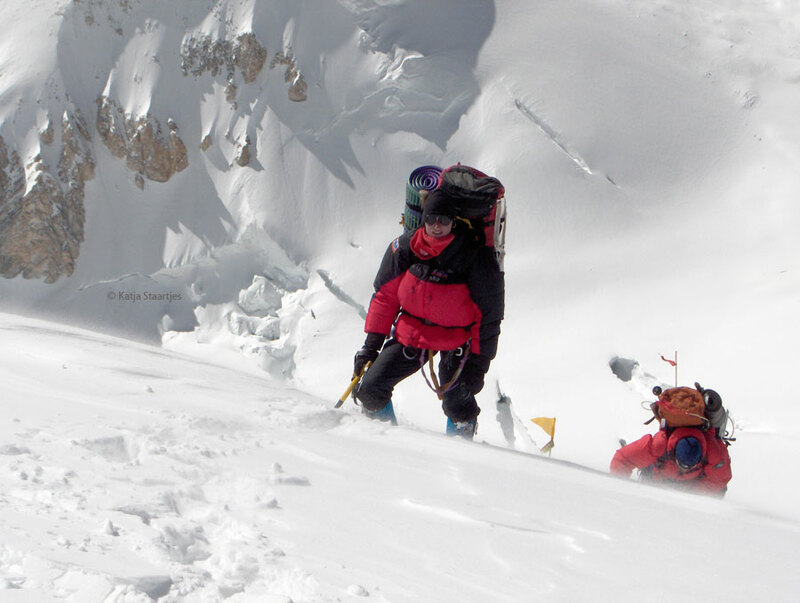 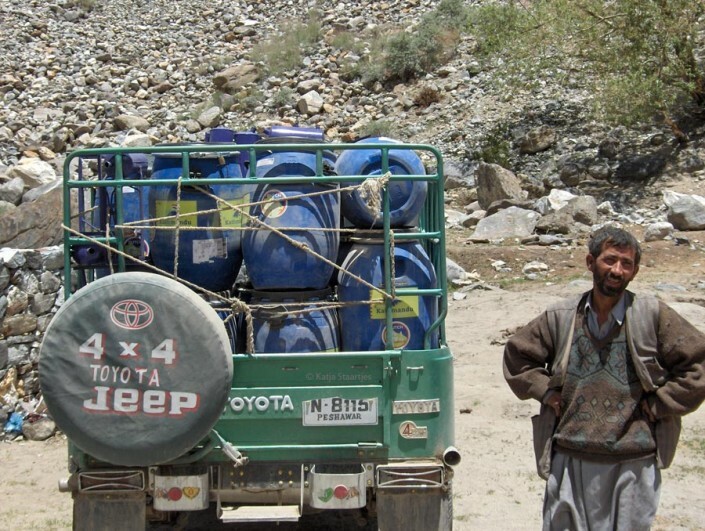 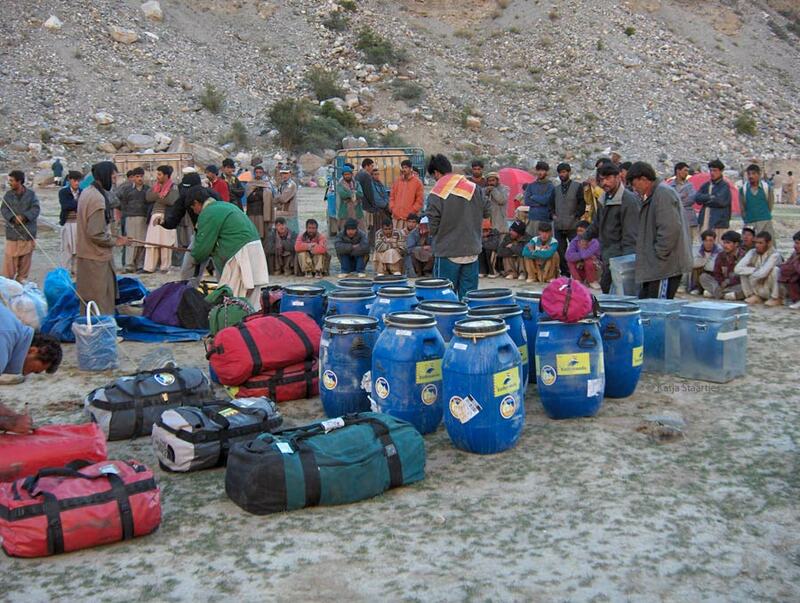 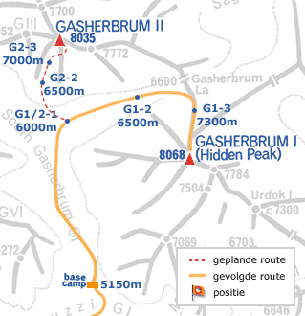 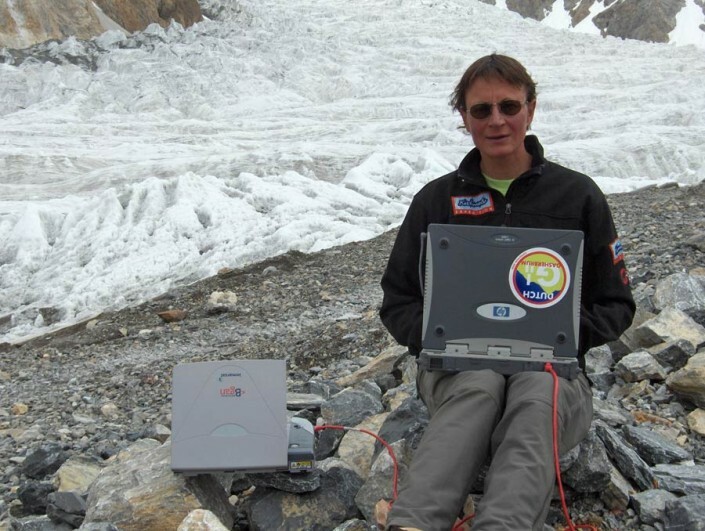 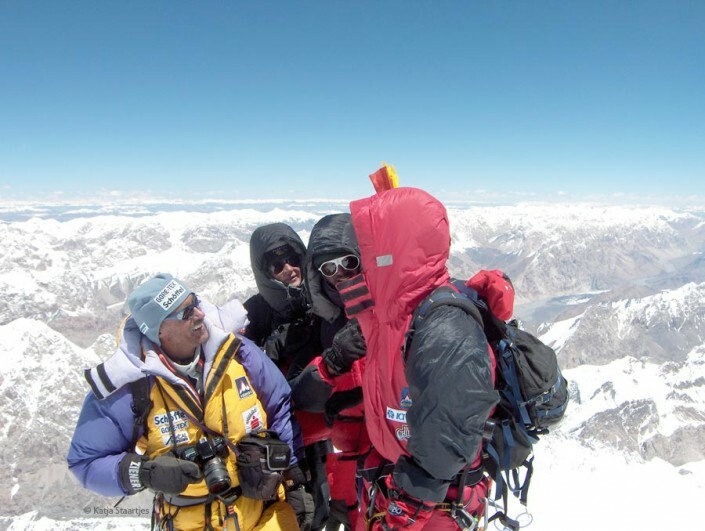 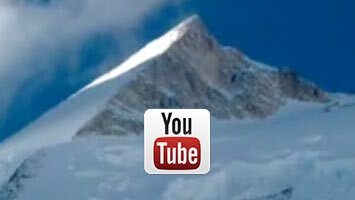 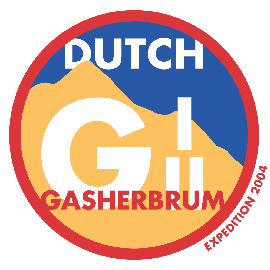 The G1-expedition was the first independent expedition to an 8000+ mountain for Katja Staartjes and Henk Wesselius. The Dutch mountaineering couple were joined by two Pakistani team mates: Amin Ullah Baig and Jhan Baig (from Shimshal, Hunza valley). 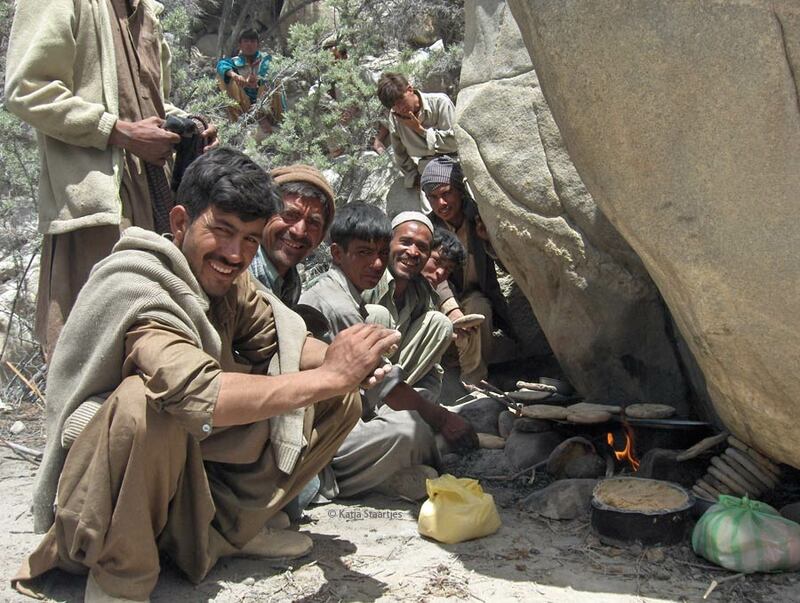 In the base camp they had the support of the cook, Allam, and there was liason officer Imran. 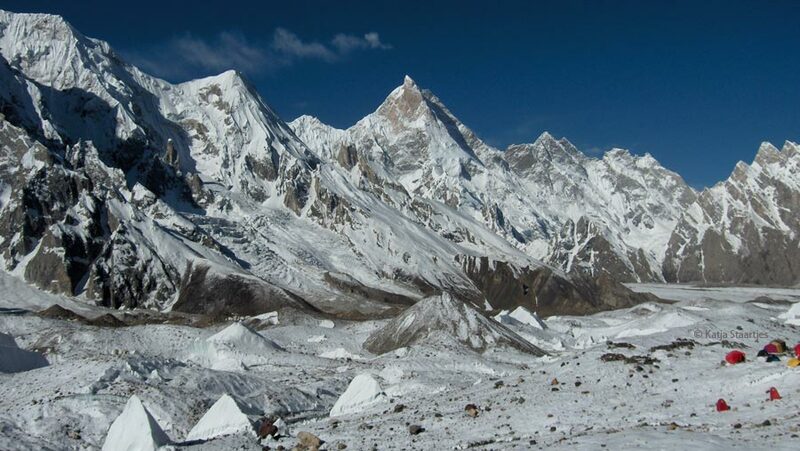 Katja: “We arrived 13th june in base camp and in the beginning we had excellent weather. 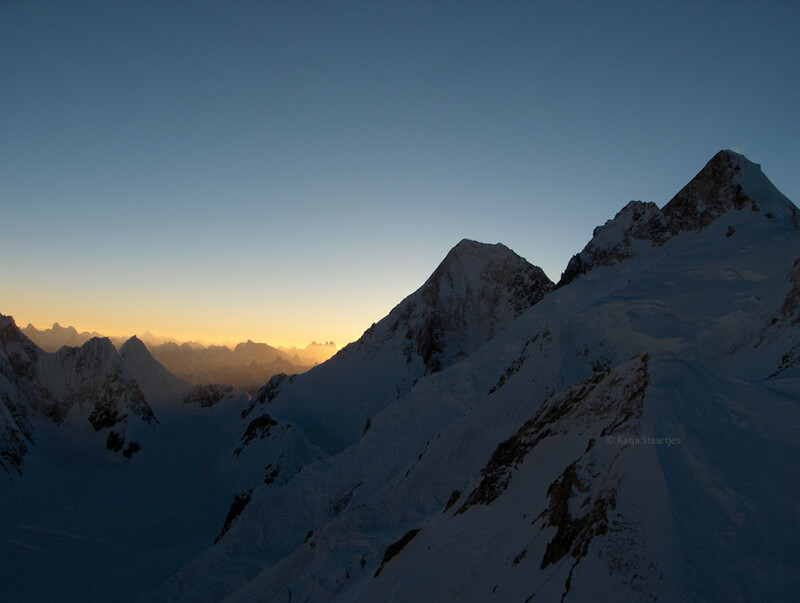 However, it lasted only until 22nd June. 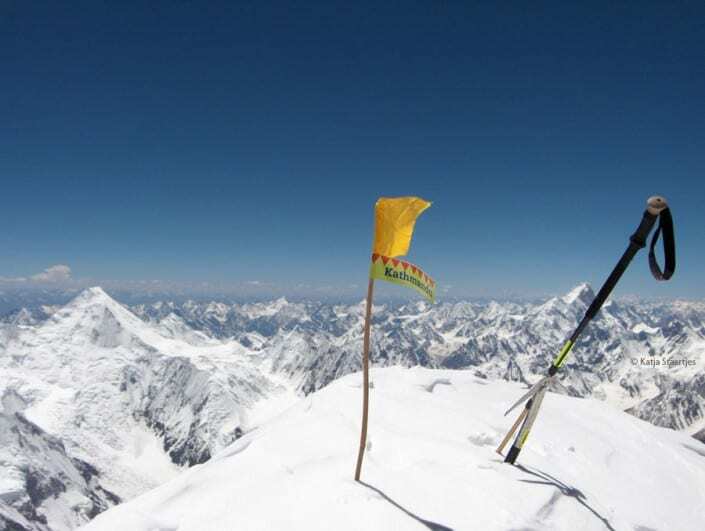 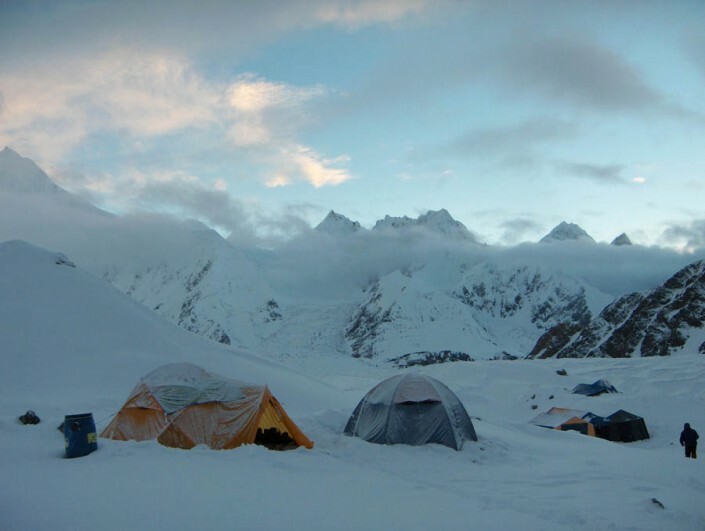 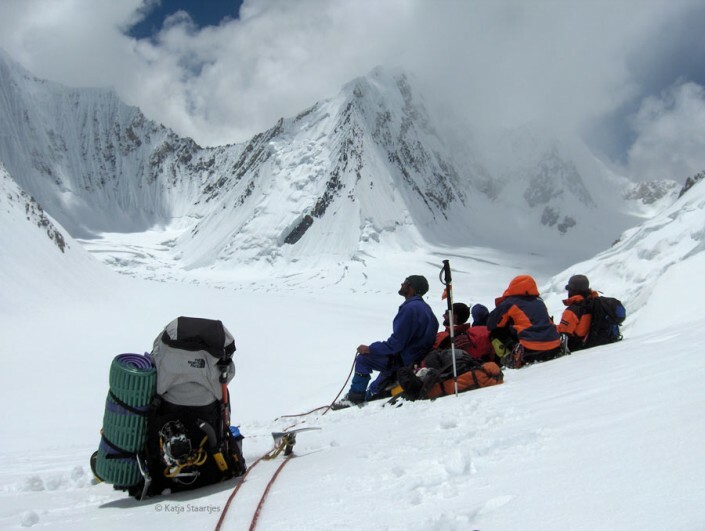 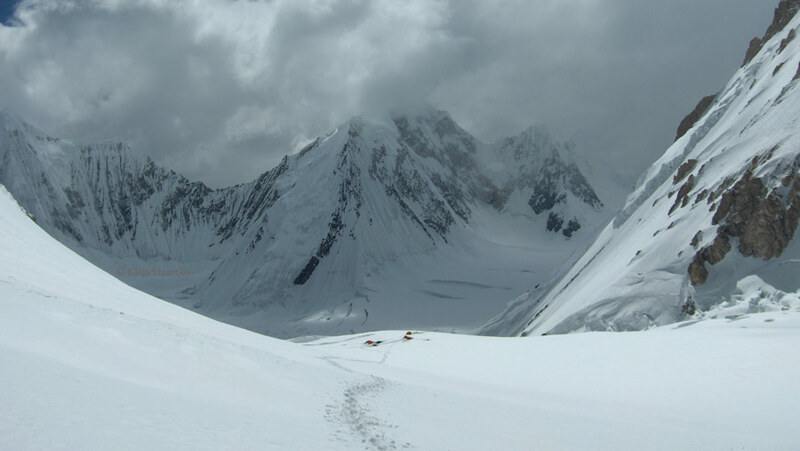 The rest of the climbing season in Pakistan was known for its disappointing weather: unceasing snow relieved only by high level storms for days on end, interspersed with only a day or two of good weather. 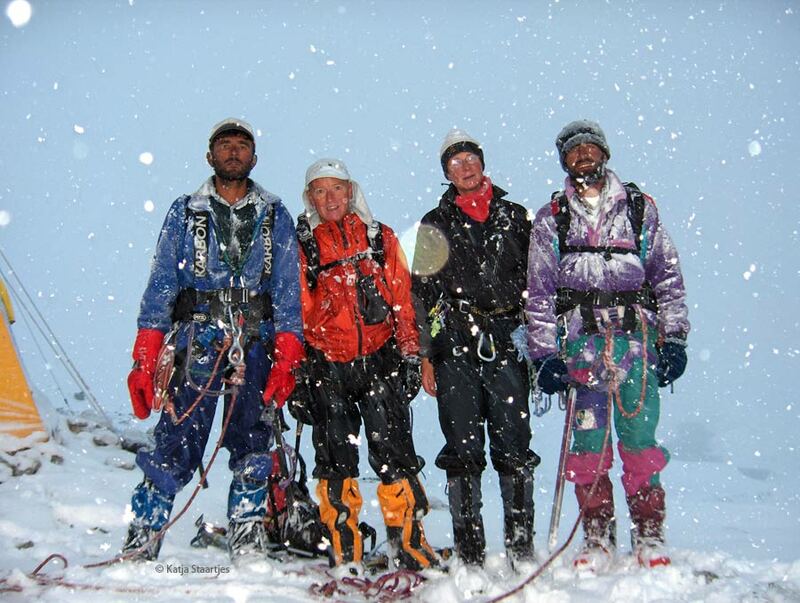 Several expeditions returned home without having achieved their goals. 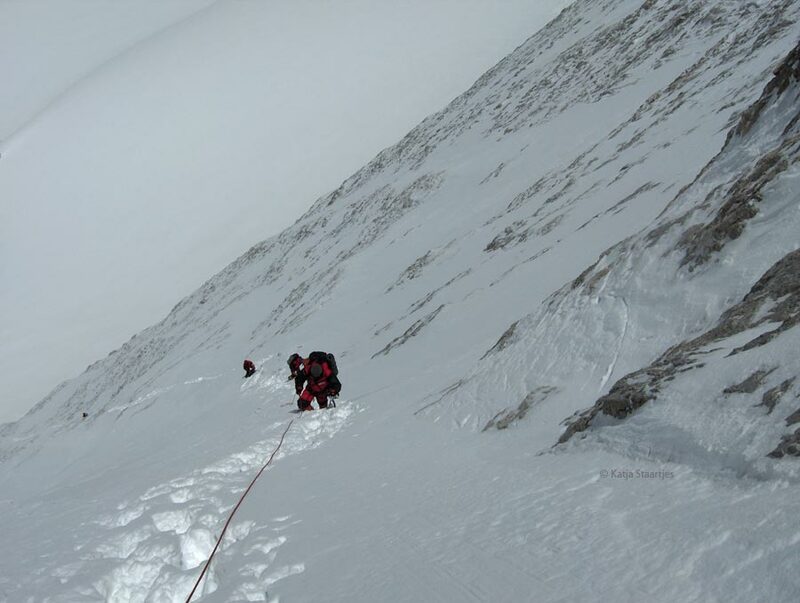 The patience and persistence paid off at last. 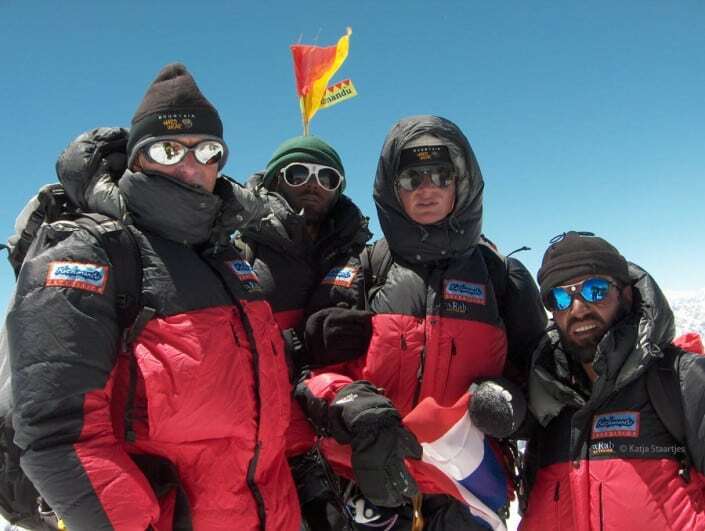 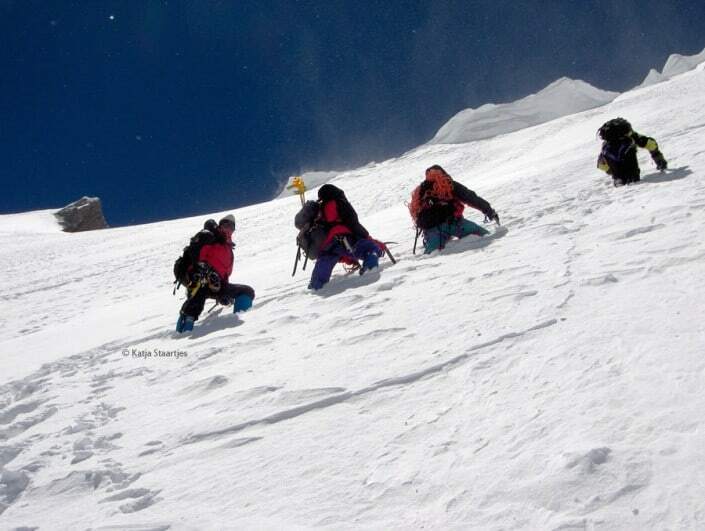 On 25th July, with our team of four we stood at the top of G1 in glorious weather. 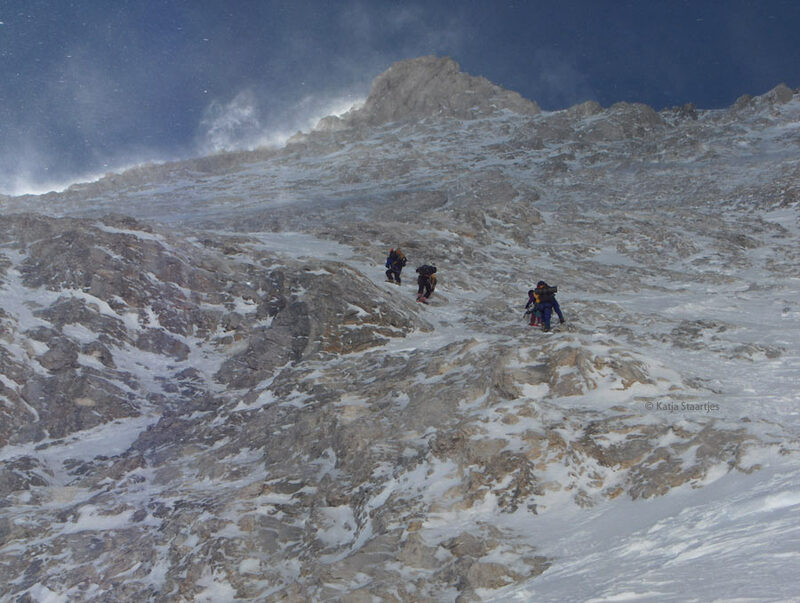 This was possible thanks to the excellent teamwork with two other small teams: a team with Ralf Dujmovits & Gerlinde Kaltenbrunner plus a Spanish team with Carlos Pauner.